World Record Title: Mr. Li Duguo is the man who puts out the most revolving candles within 1 minute in the world. World Record Creator: Mr. Li Duguo. World Record Holder: Mr. Li Duguo. World Record Rules: 1, the man who puts out the most revolving candles within 1 minute in the world. 2, whip total length of 6.16 meters. 3, lit the candle flame from the ground 1.12 meters, 7.44 seconds a lap speed of candles, candle No. 1. 4, and 6 meters farthest distance candle (candle holder diameter 0.81 m) 5, can not put the candle down with playing a candle, or chipping. World Record Value: One minute with a whip to fight off six candles. Mr. Li Duguo is the man who puts out the most revolving candles within 1 minute in the world. Verified on 18 August 2016. 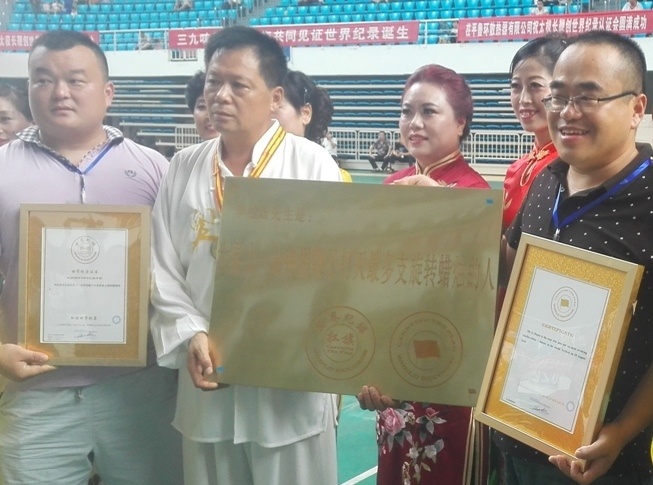 Previous:August 21, 2016 Guiyang world record c… Next :No!